When you get an order, you should redirect it to AliExpress supplier. If you don’t have any automated solutions, you should place the orders manually. So, you should visit AliExpress to purchase the item from the supplier. When placing your order, enter your customer’s name and shipping address and let the AliExpress seller handles the rest. The seller's details can be found in the Products section. In Supplier info tab there are links to the product on AliExpress and to the store. Suppliers' details for all products can also be viewed in Product analysis tab (Import Products - View Details - Product analysis). Here you get a link to the product and the supplier’s store on AliExpress. 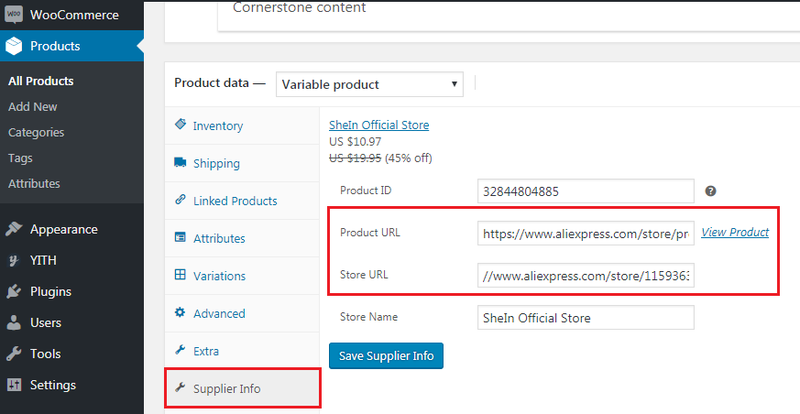 To view this info, you should have AliDropship Chrome extension installed and be logged into your AliExpress account. It’s better to select ePacket shipping if it’s available as a shipping option. DropshipMe allows filtering out the products with ePacket and free shipping options. Depending on the supplier’s processing time, you’ll receive an email notifying that your order has been shipped. To make the process much easier, you can use some special automated solutions like AliDropship plugin. It saves you the trouble of having numerous lists of products, suppliers, prices, customers and addresses – AliDropship can handle all this for you. Here you can learn more about processing orders with AliDropship.